Located at the southern riverside of the Guadalquivir, Restaurant El Mirador offers one of the best panoramic views of Cordoba’s historic downtown. Dominated by the Royal Fortress and the Grand Mosque and Cathedral, it lies right across the river. 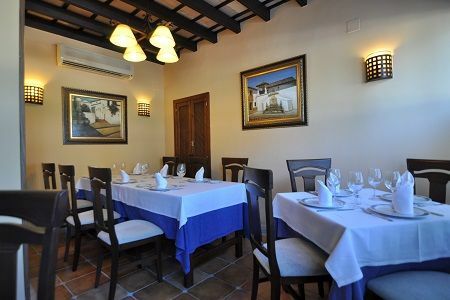 Opened in 2000, the restaurant not only excels for the offered vistas. In the course of the years it has become a culinary reference in town. Worth mentioning are the professional service and the variety of dishes and tapas prepared after regional receipes. Guests may enjoy the culinary delights either on the terrace in front of the restaurant or in the air-conditioned interior. With a rustic yet elegant ambiance, the inside provides a well-being atmosphere. Offering capacity for up to 170 guests in the restaurant and 25 more guests in the cafe, the house is quite perfect to accommodate even large groups of travelers. Another plus: Guests normally find a parking spot around the corner without the hassle of searching.